I love photographing weddings in Sheffield and its always great to find a new venue we haven’t been to before. The Old Vicarage in Ridgeway is tucked out of the way up a long drive with beautiful grounds – the ideal place for an intimate wedding ceremony. Sandra arrived in style in her wedding car looking amazing. The ceremony was fantastic with lots of laughter, it was then time to head outdoors for a few photos in the Spring sunshine. Inside guests sat down for a fabulous meal topped off with a tasty looking cake! Helen & Paul are Lake District wedding photographers covering weddings in Cumbria. 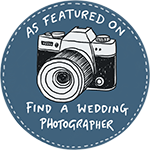 They also photograph weddings in Sheffield and the Peak District – we even photograph weddings in Yorkshire too!